fruits, vines, flowers, turf and ornamentals. Campbells Trace-it Total is a fully water soluble fertiliser, containing a complete range of micronutrients required for crop development. The specific ratios of nutrients in Trace-it Total are designed to meet the ongoing micronutrient demands of high quality horticultural crops. Campbells Trace-it Total is suitable for application via irrigation systems and can be used for foliar spraying. It dissolves rapidly and completely and remains in solution ready for root absorption or is taken in via leaf surfaces. 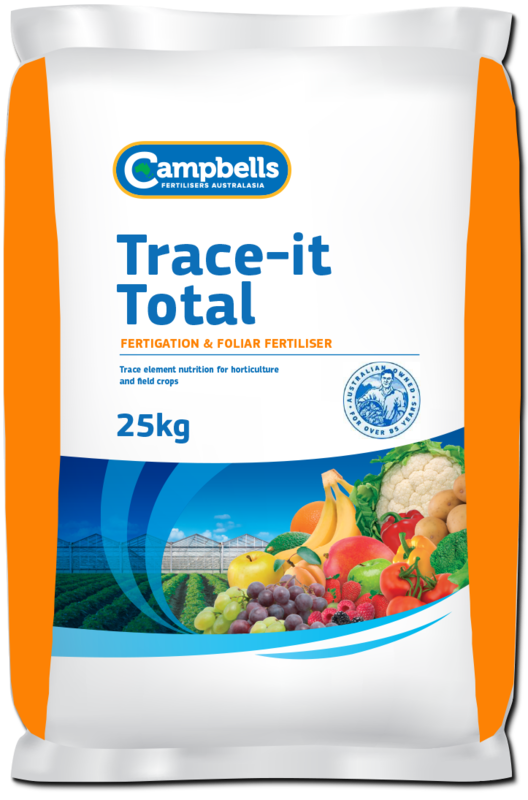 Campbells Trace-it Total can be used throughout the life of the crop, in conjunction with macronutrient fertilisers, at regular intervals to make sure your production and yields are not compromised by micronutrient deficiencies. General fertigation and foliar rates for horticultural crops are between 0.5-1.0 kg/ha. Foliar applications should be avoided during extremes of climate and during flowering. The actual rates, number of applications and their timing will vary considerably for different crops and for different districts. Before application, seek advice from your Campbells Trace-it Total distributor or your local agronomist.